As in many of Shakespeare’s plays, Much Ado About Nothing is a play about love. Most particularly the love between two couples: Hero and Claudio and Beatrice and Benedick. Hero and Claudio are devoted to each other until they fall victim to a malicious plot designed to part them. Beatrice and Benedick have forever been locked in a lively war of words, until their friends decide they are ‘made for each other’ and hatch a plan to unite them. There is deceit and many complications along the way, and trust is severely tested. But with the local comic constabulary to lend a helping hand, and the goodwill of family and friends, there is sure to be a happy ending. Isn’t there? As one scene ends, a man with the guitar comes on and sings All You Need Is Love. 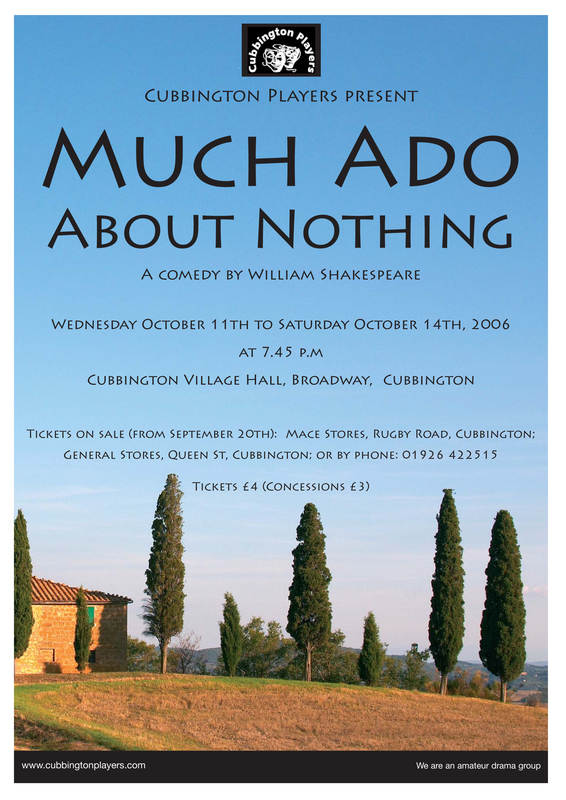 The simple lyrics were aptly chosen for Shakespeare’s love comedy Much Ado About Nothing, performed by the Cubbington Players. A delicious comedy feast, this sumptuous offering left a wonderful aftertaste. With a script dripping with wit and humour, the company managed the production wonderfully. The play’s sharper characters, Ruth Bishop and Phil Kohler played the parts of Beatrice and Benedick to perfection. Mr Kohler especially shone. He showed not only Benedick’s witty and funny side, but switched from vulnerable to strong without hesitation. Playing Leonato and Antonio, Barry West and Joseph Hughes delivered lines with an ease and grace that reflected their social position in the play. Against a backdrop of trees and a fountain, the set captured the hot Italian town of Messina well, and was also used for the actors to hide in, much to the audience’s amusement. A backdrop of blue with a sprinkle of stars illuminated the stage beautifully for the night scenes.